Total Time: It is possible to easily make this cake in one day using pre-made caramel. It is also possible to make this cake in one day if you make your own caramel, but it requires planning your time well due to the caramel needing about 3-4 hours to cook and cool off. The flavor will be amazing the moment you are done making the cake. However the flavor is even better if you put the cake in the refrigerator overnight. Thank you, Kristyna for your WONDERFUL video recipes!! I am an American, married to Jiri, a Czech from Havirov. For the past 13 years I have begged, bribed, and threatened my darling husband for Czech recipes so I can cook his favorite home dishes for him. I have finagled a few from my mother-law when we go over there, and even LESS from Jiri!! The two of them always tell me “we don’t have the same ingredients in the US!” Well!! BOLOGNA!!! The fruit dumplings and chocolate crepes just about took him down to tears….but! !….this honey cake did it!! My mother-in-law makes this every time we go over there, and of course I have NEVER been able to sweet talk her out of her recipe!!! The best part is that I haven’t told Jiri about your video recipes and he doesn’t understand how I all of a sudden I can cook like a Czech wife!!!!!! Well… too bad I don’t live around the corner!! For sure I’d be your “fill-in” taste tester!! Thanks for the comment and Ilook forward to seeing whats next!! 😀 You would be great taste tester. It wasn’t as hard to make as I thought it would be; many steps, but when your ingredients are ready, it’s a breeze and not long to make. Dekuji moc for this other awesome recipe that takes me back to CZ. Strasne moc dekuju za pomoc, manzel je american, a miluje cesky jidla… Obcas chci zkusit neco noveho ale mam problem najit spravne ingredience!!! Diky vam muzu varit nove a nove veci… Dekuju, dekuju, dekuju!!!! You r the best! Hi! For the cake, Can I make it 1 whole cake and then just cut then in thin layers?instead of baking them separately. I don’t think it would work. When it is baked it is pretty spongy. Plus with this one you are trying to have as thin layers as possible. And I don’t think you can cut them as thin. Some people would do 9 up to 15 layers and bake them all separately. Too much work, that is why I created the recipe for just 4 layers. Me and my girlfriend made medovnik a few weeks ago, and it had a great taste, but we were making the thicker version of dough that has to be rolled with the roller, and now we would like to make this version of dough, because as we seen in the video that was taken in Marlenka factory, their dough is also made like this – it can be spread with this tool that you are using in your video. So my question is: what’s the size of the cup’s that you are using for measuring your ingridients or maybe even better, can you write down the weight of the ingridients for the dough. Here in the USA we measure with cups and spoons. You can probably buy this measuring set outside of US as well. It is very similar to an average size coffee mug. You just don’t fill the mug all the way to the top. Good luck making it and let me know if you have more questions. Hi! Could you please clarify how many grams/pounds 3 sticks of butter are? Is the product you use unsalted? Thank you very much for your wonderful recipes and the effort you put into presenting them to us! Hello Kristyna, I am from India. For the first time ever I baked a cake on my husband’s birthday. Though I could not reach to perfection but the cake tasted yummy. My husband and his friends loved the cake tasted. You get all credit for the compliments I got. Dear Kristyna, this cake is heavenly good. The method of doing this cake is not very difficult as I think. Especially with the guide of ur video it makes the method more easier to follow. I really appreciated that you share this great recipe online. My son just can’t stop eating this. And I call it a devil drug honey cake coz u just can’t control urself but addict to it. Love it n thumb up for you. I am sad to hear that it didn’t come out right. I am thinking that the problem must be the caramel filling. The cream should not be hard at all. The caramel is what makes the cake softer over night. My caramel is always very runny. Thanks I reckon the same! I used nestle sweetened condensed milk and so far couldn’t find any other brand in the market (I live in Dubai). Sounds like the butter hardened in the . When I make buttercream frosting, that happens. I have to let the frosting come up to room temperature. Thank you so much for the recipe and it help to bring back my sweet memories in Czech back in 2003…. Same to Michelle, I have been trying so hard to get the recipe… Love you so much! Dekuiji…. Haven’t made the cake yet but looks fantastic ! Easy to follow hopefully it will turn out as nice as yours. I found this useful conversion website that I thought would be good to share with everyone. I made the cake however it is quite chewy as my cake pieces were very flat.i used plain flour & wondered should it be self raising flour instead? I am also using regular all purpose flour. The cake pieces are pretty flat and little chewy. They rise while baking and then they go flat. Did you like the way it taste it? The same thing happened to me. The pieces were very flat and chewy, and mine stuck to the paper! I wonder if you have to let the batter cool before you add the flour mixture? Hm, not really sure because more you let it cool off, harder it gets to spread the batter. It probably just need it more time to bake. It does come out on a chewy and flat side. My son has requested that I make this for his birthday next week. Do you have the directions written somewhere in addition to referring to the video? Can’t wait to make it! Aww that is sweet. He will surely enjoy it. 🙂 I am sorry, but I don’t have the written instructions. I am currently working on my kindle cookbook where it will be all written down. But it will take some time before it is ready. Please let me know if you have any questions. I must say this has to be the best tasting cake in the world! It is so more-ish and just melt in your mouth delicious! Thank you so much for sharing your recipe. I now have to make the cake for my cousin’s birthday however I am running low on time to make it. Is it ok to bake the cake layers a day or so before hand and then assemble the morning of the party? Do you think the cake layers will dry out? Hi Kristýna! I wanted to tell you how much I love your site! I have already made a couple recipes since I discovered your site last week. I recently returned from an internship with Honeywell in Brno and it’s been great bringing Czech cooking back to Kansas. I just have one question about your Medovnik: my cake turned out more dense and chewy than I remember having in Brno; do you have any theories about why? The taste was wonderful, and I would make it again in a heartbeat, I was just wondering about the density. Admittedly, the honey I used was crystallized slightly and I don’t know how old the baking soda I used was. Hi Michael, that is nice to hear you went to my hometown Brno. 🙂 There are different types of medovnik. Some are more cake like. I had it chewy once when I left the bowl with a batter over the steam the whole time and was spreading the batter while it was kept over the steam all 4 cups. So the batter was spreading nicely and was warm, but the cake turned out chewy. Steve really enjoyed it chewy. 🙂 Sometimes it is like a science. I don’t think it was the honey since by heating up it melted. Hopefully next time it will be less chewy. Bydlim v USA a nejak jsem nepostrehla teplotu trouby. Jestli muzu poprosit ve Fahrenheit. Dnes budu delat medovnik a nemuzu se dockat! Tesime se na vsechny Tve recepty. I am unable to get the instructions. I can get the ingredients but not the instructions. I have to watch the video and write down the instructions. I like to watch the videos anyway to see how you do it. What temperature is your oven at? I am figuring 350degrees. Thank you for this recipe. I have a Czech friend coming to visit. Want to surprise him. When I did the recipe, my ‘pancakes’ stuck to the parchment paper. What went wrong?? Did I bake them too little? Were they supposed to be crunchy? Was the batter not thick enough? Sorry to hear that. I think they were not baked enough. 🙁 The edges should have been crunchy. I’ve been racking my brain over this, and read some of the comments from other folks who have tried this recipe to try to figure out what we’ve all done wrong. I did a bunch of internet searches, and looked through some “science of baking” text books. I have a couple of theories. First, I think we may not need to keep the butter-honey-sugar mixture over the double boiler. Once the sugar is melted, I’m going to take it off the heat, and let it cool down a bit before I add the eggs-flour-soda. If it still remains too sticky/chewy, I’m going to simply melt the butter in the microwave and not use a double boiler at all to see if that melts the sugar on its own. I have a feeling that is why folks’ cakes are too dense/chewy. The heat and sugar are effecting the properties of the flour, and making the cake chewy. Second, measuring flour by volume (cups) is a tricky business. Did you stir it up first? Was the flour packed down? If you randomly scoop out a cup of flour, and weigh it each time, it can weigh anywhere from 3-7 ounces! I went to your weight conversion chart and saw that 1 cup = 150 grams (5.29 ounces). According to the master weight chart of ingredients published by King Arthur Flour , 1 cup of AP flour weighs 120 grams (4.25 ounces). That’s THREE cups of flour, so you see why doing flour by volume could cause a big problem for people when trying to duplicate some else’s recipe. To do the recipe by weight according to YOUR weight-conversion chart, there should be 13.23 ounces or 375 grams of flour. Or, what you referred to, by volume, as 2.5 cups of flour. Either way, it appears that I had WAY too little flour in my batter. I’ll try again tomorrow night. I really want this recipe to work! Grams are always more accurate than cups. Every time I scoop up the flour and put it on scale is is 150 grams. I don’t pack it down. Just scoop it up from a big container. Its working better with more flour, but it’s still VERY sticky on the parchment paper. I have to use an offset spatula to cut it off the paper before I can get it off the paper. I did NOT use the double boiler this time. I just heated the butter and put the sugar/honey is and mixed it until the sugar dissolved before I added the rest of the ingredients. It does make it a tiny bit harder to spread on the paper, but it wasn’t bad. When I make this again, I’ll try using an even 400g of flour. You don’t suppose I have to mix the flour in longer, do you? Maybe build up a little more gluten? When you put the flour in, how long do you mix it? Just until it comes together or a bit longer? Hm, that is strange. I don’t mix it too long, just till it is all mixed up. Did you bake it any longer? Wow.. It was simply amazing. Do you think adding sour cream to the condensed milk , will make it tastier ? because i saw other recipes adding sour cream. I see the ingredients on this page but nothing after that …. then the comments. I only buy unbleached, but you can use any all purpose. Hi Rok, that makes me happy to hear how much your family enjoys it. 🙂 I don’t have the cacao version yet. But for sure in the future I will be working on creating the recipe. First, I’m soooo excited to see you’re website and videos. My husband and I lived in and got married in Prague, and Medovnik was our wedding cake! I’ve tried recipes before for it, but haven’t been successful. One question: what size was your cutting board? It looked like the right size to portion out the dough correctly. That is wonderful you had wedding in Prague. 🙂 I am on the road right now and only have mobile devices. If you watch the video on the computer you should be able to see the measurements in the video. I put it as a text overlay. The texts only work on computer. This is how YouTube has it. Sorry about that. Hi! Thank you for putting up this wonderful recipe, you are very talented! The cake looks absolutely delicious and I can’t wait to try make it over the weekend 🙂 Just a question – can I use self raising flour instead of the baking soda? If so, how much should I use? Thank you Lily for your nice compliment ! 🙂 Hm, I don’t have any experience with self rising flour, but I think it should work. I would just use same amount of flour. Good luck with it! 1. Do you know by any chance what to add into the caramel mixture so it holds better in room temperature? More butter? add icing sugar? gelatin perhaps? 2. How to make the caramel less sweet, boil it longer perhaps? 3. Walnut is pretty expensive nowadays.. do you recommend any other cheaper alternatives, like almond or other nuts? Many many thanksss. Thank you for coming to this world and sharing your cake. 1. I would wait till all the layers of the cake completely cool off. It does make a difference. Putting less butter would most likely make it thicker, but it might not be enough of a caramel. 2. I don’t think there is a way to make the caramel less sweet. But sometimes I do reduce the sugar amount in the cake batter. It makes a difference. Helloo i tried this cake but it turned solid when i refrigerated so can you plz help me to fix it? I am sorry to hear that. 🙁 I am not sure what went wrong. Did you already put the cake together with cream? The cream should softened it. 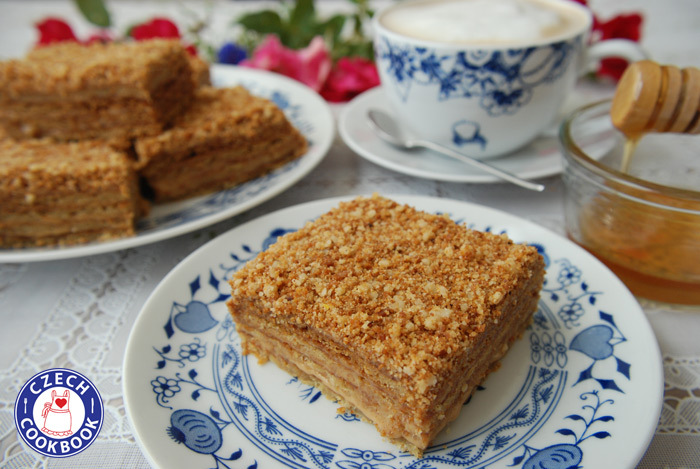 Hi kristyna, a friend gave a piece of the honeycake that she made based on your recipe and I absolutely love it! I am making the caramel and I overboiled it for 3hrs! Would it be OK? Should I remake my caramel? Your advise will be much appreciated. Try to open it and taste it if it is not bitter. It should taste sweet. Good luck! Honey Cake is amazing! We tried it in when we visited Prague and when we left we looked all over the internet for a good recipe and stumbled upon your page. We have just written a blog post about it and referenced your website for the recipe! Thank you so much! So happy to hear you enjoyed it! Nothing like good delicious honey cake. 🙂 Great post! In my recipe there is no other layer with mascarpone. Maybe somebody else makes it that way, but the way I make it is more typical for honey cake. This recipe does make larger cake. But we never had problems eating it. 🙂 You can share it with more friends or neighbors. It also lasts in the fridge for a week. I can’t thank you enough for sharing the recipe of this Heavenly, Amazingly, Yummmy Yuummy Honey cake with us. Truly… words aren’t enough to describe the taste of it.. The first time I tasted honey cake was when my son bought a small piece from a food market here in Perth about 3 months ago and it was very expensive… So, I googled it wanting to know more information about this unusual cake until I came across your website and this video. I followed your instructions carefully, and it came out soooo delicious and it had the exact same taste of the one my son bought from the food market !!! I made it again today, but this time I’ve shared it with some friends and they loved it!!! My youngest son can’t have enough of it and I don’t think the cake will last until tomorrow….. So thank you again Kristyna, and wish you all the best in life. Sorry, I forgot: Regards from Auburn hills, Michigan from girl from Olomouc (on long vacation). I have been watching your You Tube videos and have enjoyed learning about the Czech Republic, your traditions and recipes.! Your home town in the Czech Republic, Brno looks magical ,especially with the snow falling down onto the beautiful architecture! I made the Honey Cakes a few months ths back…a complete and bc Fail! Came out as hard as a rock. I decided to give it another try this last weekend for our Sunday night familly dinner and it was a sucess!! I was wondering if it could be frozen then thawed the morning? Thank you for your recipe which I made tonight as a treat for an Armenian friend. I looked at several different recipes but your one stood out, especially as I was able to follow your video. I must admit I feel stuffed already just from licking the spoons/whisks/bowls used preparing the cake and can’t wait to try the cake tomorrow. Kind regards, Alexandra from Cricklewood, London, England. I am glad to hear Alexandra! I hope you all enjoyed the cake. 🙂 Many greetings to London! I am having a Czech dinner at my house and my friend was in Prague and she told me she ate honey cake everyday, so I had to try this recipe. I made a practice cake tonight and also had trouble with the parchment paper sticking to the cake. The cake baked unevenly with the center of the cake sticking to the paper. I am wondering what we did wrong. Has anyone else figured out how to keep the center from sticking to the parchment? We baked the cakes a little longer and they did look almost burnt, but the browner the crisper they were. I am thinking the batter was thicker in the middle? (I did pour initially into the center) OR we did not let them cool sufficiently. If anyone has any other ideas, it would be great to know as I have a dinner in three weeks and am hoping the next one will be perfect! Can’t wait to eat this one on Easter. I am sorry to hear that! I have never had issues with it sticking to the baking paper. Maybe it wasn’t evenly spread? Seams like the middle wasn’t baked completely that is why it sticked. I hope it will come out perfect next time! Thank you! The dinner is coming up. My fingers are crossed that it will work out. We are using many of your recipes for this dinner. My Czech grandparents would be proud of my efforts to create authentic Czech food. Amazing Maureen! They would be very proud! Wishing you all the success! Thank you so much for this recipe AND the step by step instructions. I visited Prague recently and loved the honey cake so much. Your cake turned out beautifully and tastes just like I remember! The second time I made it, I reduced the butter by half a stick and reduced the sugar by 1/4 cup – I like it a little better that way. I also made a slightly smaller cake but with 5 cake layers. My husband who *always* chooses chocolate chose this for Father’s Day. I was shocked! Finally, I had no IDEA you could make caramel this way. Just that tip, alone, was huge for me!! I am glad to hear how much is my honey cake recipe a hit! Thank you so much for this recipe and the easy to follow video. It is pure joy to watch you cook & eat 🙂 My husband dreamt of this cake ever since we visited Prague. I made your recipe for his birthday and he was blown away. He said it tasted exactly like the one from Prague. Aww, thank you so much Sandra! It makes me happy to hear how much your husband enjoys the cake and I truly hope my recipes will bring lots of joy and lots of great memories. 🙂 Many greetings to Vienna! We visited Vienna last summer and we so loved it! Your cake turned out beautiful! Great job! Hi kristyna. I just wanted to say thankyou. Thanks so much. Im indonesian but my husband is czech. And we live in Perth, that’s only 1 honey cake shop here but you know it’s bit costly. so i decided to make myself and like usual i also go to your website. I actually did some czech recipe from you lile goulash and knedliky, and he loved it so much. So to make this medovnik I followed all the recipe, except using the mixer coz we don’t have it. But surprisingly the cake came out so delicious even though i stirred manually with the whisk. I lived with 4 czech people include my husband and they were saying “it’s like a magic” and the cake tasted was perfect. Everyone loved it. Its my husband’s favorite cake,so he was so happy and kept saying “so delicious ” It was my first time to make and succeed. Thanks to you Thankyou so much!!!!! Hi Aryana, thank you for letting me know! Great job! I am sure your husband is so blessed to have you! Many greetings! I made the honey cake last year for Thanksgiving because my granddaughters had a friend from Czech visiting. It was a big hit. So much so that I was just asked if I am making it again this year for Thanksgiving. Same friend from Czech will be here as well. It was not difficult to make and was very good. Your video was very easy to follow. I made this honey cake twice. The first time I boiled the condensed milk and the second time I bought the ready made caramel condensed milk. I must say that the boiled version tasted better and lasted longer before getting a sour taste. They both produce the exact same result but I could taste a very small difference in flavour.. I think boiling the condensed milk produced a better flavour but takes longer than buying the ready made caramel. My husband is Czech. We just returned from our second trip to Prague. We enjoyed Medovnik during our visit. I just finished my first attempt following your recipe. I will be bringing it to a Czech themed dinner tomorrow. Thank you so much for your step by step instructions. I’m hoping everyone will enjoy it. That is wonderful! Yes I hope everyone will enjoy it. My wife is Czech & she said this cake she had for her Birthday each year, it’s a celebration cake not an everyday cake, which is why I’m making it for Valentine’s Day. I’m not Czech myself but both my wife & mother-in-law told me about a secret syrup they use on the cake between each layer so it not only softens it but also gives it another taste/dimension. Have you ever used a syrup also? I guess all Maminka & Babitckas have their own versions don’t they..
Love the cake & thanks for sharing you’re recipe! I made this cake yesterday and I really enjoyed making it. I am sure I used unsalted better and my flour isn’t salty I use it all the time. Does any one had this problem? Or does the cake supposed to be like that? I dont know but I am sure next time I will use less amount and with baking powder nod soda. Hi Afaf, I am sorry to hear that! I have not hear from anyone else that the cake would turned out salty and bitter. I wonder why. Mine is always very sweet. I also tried this today and felt that the taste of soda was very overpowering, it could be due to thicker layers of cake, but 1tbsp seems too much. Everyone loved it, so it could be just me. Mohu poprosit o recept na testo v gramech?? To je mi líto. Během par dni přidám na blog na tento recept gramy. Naměřila a vyzkoušela jsem to kvůli tištěné kucharce kterou píšeme. To vypada krasne! I’m just wondering where you got that tool to spread the batter? Hi Kristyna, I love this recipe! Thank you for posting it…I tried to make it yesterday, but my layers turned out more like biscuit and had a lot of crunch to them. Any thoughts on where I went wrong? I have tried this cake before from a store and theirs was lovely and soft, so I’m hoping you can give me a few pointers. It should be more on a chewy side when it is done baking. Maybe it was too baked? It also softens up with the cream. Did you layer it all together? I did suspect I overbaked, so perhaps I’ll try to pull it out a little earlier. It softened only slightly after a day with the cream between the layers. I’ll give it another try, thank you!! I hope this time it will work. I made this for my young daughter’s birthday at my Czech husband’s request, and the cake layers were so chewy and the caramel layer so thick that I felt like I was chewing gum rather than cake. My husband tried to pretend to like the taste of it, although he admitted the texture was off. I think it was the worst cake I’ve ever made, and I bake American and Czech desserts very often. I let it sit out at room temperature a while to see if it would soften more (it was refrigerated overnight), but it was just warm and gummy rather than cool and gummy. I was so disappointed. I’ve never had Czech medovnik, so maybe I am expecting a more cake-like confection. I see other people have tried this and found it gummy too…maybe the recipe would be better in grams? And the caramel layer is just so thick it doesn’t soak in at all. Just sits between the layers oozing around in a sludgy kind of way. Gross. I am sorry to hear that Margaret! It sounds like it was not baked enough. It shouldn’t be chewy as a gum. In my hardcover cookbook it is in grams if that helps. Usually the caramel is more runny than thick and blends great with the layers. It really doesn’t sound right. I either did the layers too thick or didn’t bake long enough. They were very sticky in the middle but cooked on the outside. I’m going to try again though!! Can you tell me how big was the layer you made so I can be sure I’m making them large and thin enough?? That definitely sounds not baked enough in the middle. I use a 12-by-9-inch, 30 cm x 23 cm cutting board. For every layer I use 1 cup of batter. Wishing you more success next time.